Enchant Christmas is a holiday event at Safeco Field November 23-December 30, 2018. 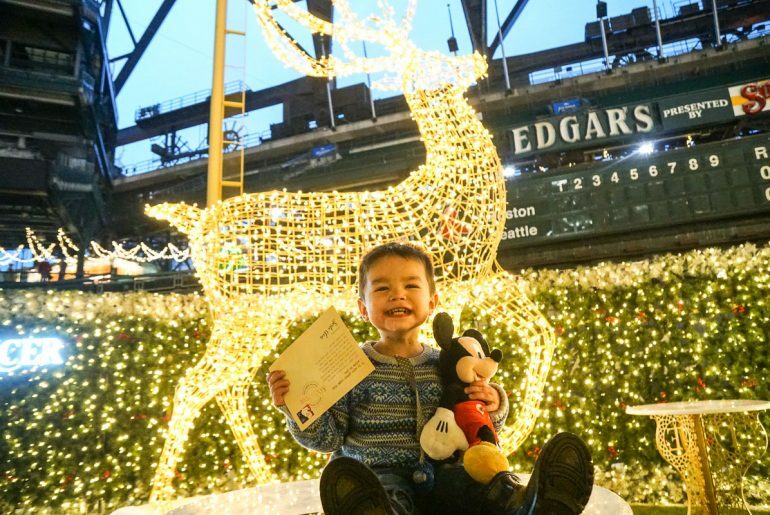 It features the world’s largest light maze, a Christmas Market, photos with Santa, ice skating, and it’s one of the newest Seattle Christmas events. 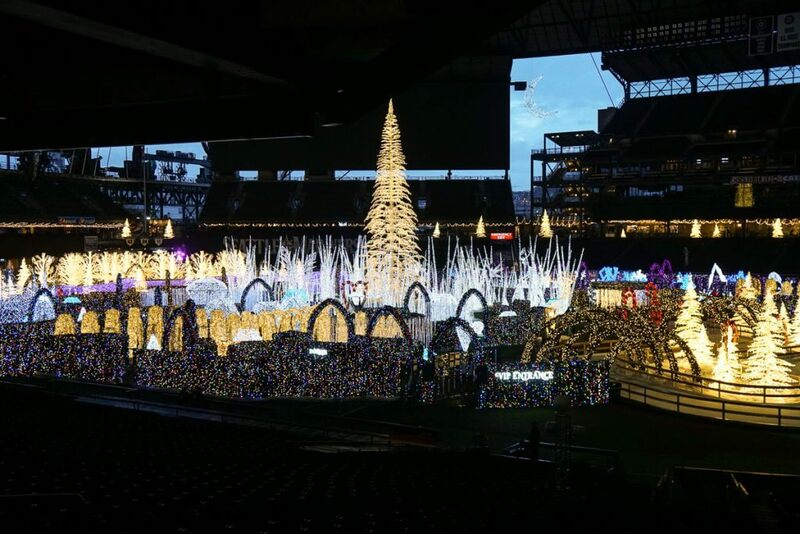 So, now that you’ve seen a glimpse inside this Seattle holiday event, let me break it down for you. 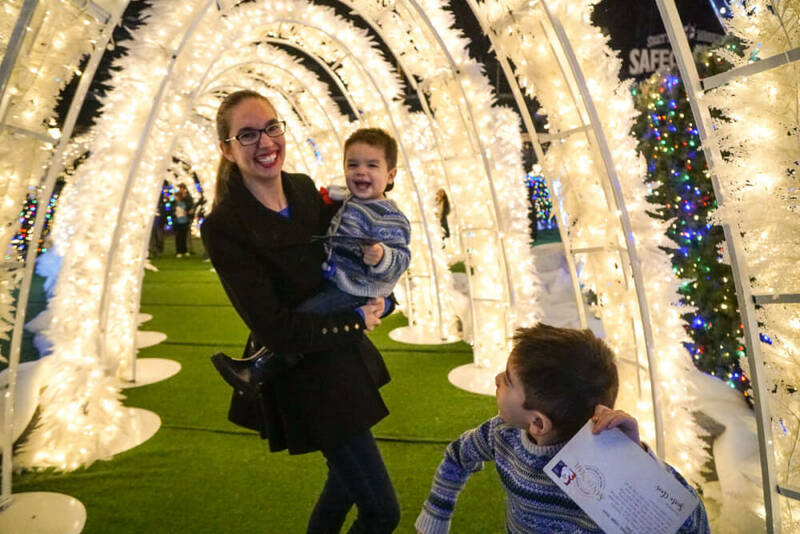 The main reason you’ll want to come to Enchant Christmas is for the World’s Largest Light Maze. It’s a stunning display of lights set up in a way I’ve never experienced before. If you are worried about losing your kids in the maze, you can put your fears to rest. While the hedges are high enough that you can’t around every corner, the pathway is large and there are frequent open spaces. I almost feel like “maze” is the wrong term. It’s nothing like a corn maze and there’s no way you’d get lost inside it. Basically, when you enter, staff members will give you a scratch card featuring all 8 reindeer hidden in the maze. Then, you can take one of three different paths into the maze and start looking for reindeer. I’ll give you a little spoiler and let you know that you can see several tops of the reindeer above the hedges so they are easy to spot! Once you get to a reindeer, walk over to a table and use one of their large medallions to scratch off the reindeer. They even have kid-size tables, which is so helpful for toddlers and preschoolers! But, it’s so much more than just searching for reindeer. Almost every where you turn, there’s a fabulous holiday display. There are a few lighted tunnels that are fun to walk through. And there’s a cool spot with dangling lights that are fun for photos. In a few areas, there’s even a bit of snow flurries that will excite kids! Finally, bring your completed scratch off card to the staff at the Maze exit and you’ll get a candy cane prize! My kids are Santa-obsessed and we visit him sometimes 5-6 times a season. It’s one of their favorite holiday traditions. Here at Enchant, Santa’s Workshop is tucked away near the event entrance. There’s a straight VIP line to the left and a winding general admission line to the right. Near the front of the line, Mrs. Claus can be spotted reading stories to the kids throughout the evening. Note: She was on break when we were there, but we heard good things! There’s also a cheerful elf who will let you know when it’s your turn to see Santa. When we were there last Tuesday, we saw our favorite Seattle Santa! He’s the Pike Place Market Santa we’ve been visiting every year for the past 5 years and he’s fabulous! The cool thing about this Santa’s Workshop is that you have the option of taking your own photo with your camera in addition to the professional photo. Then, you can take a look at the photos and see if you want to purchase any. There’s a really pretty ice rink at the back of the Light Maze. Instead of a hockey rink, it’s an ice skating trail with lights all around it. I liked the winding design. Helmets aren’t available, but you can bring your own. We didn’t go skating, but it did look really pretty and it was fun to watch for a few minutes! While it’s not your traditional European Christmas Market, you can also find holiday gift items at Enchant. The booths are spaced out around the concourse and have items like teddy bears, candles, beauty products, chocolate, jewelry, and more. And because they are spread out, you can do a few on your way to and from the Light Maze instead of doing all of them at once. Right past that is Santa’s Sleigh! 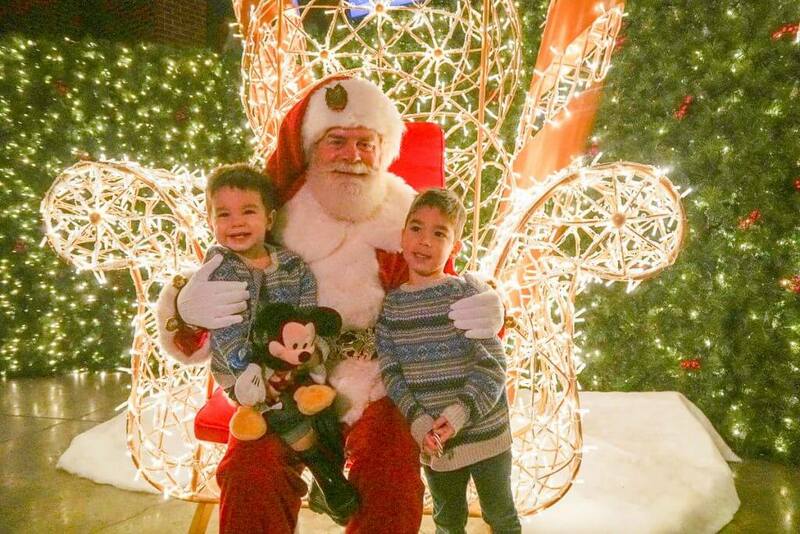 Finding Santa’s Sleigh was a major highlight for our boys and made for a cute photo op! Photo credit: Super nice stranger! Unless you have VIP tickets, your food options are stadium food at stadium prices. Plus there’s a coffee stand and a booth with some treats, like donuts. Inside the Light Maze, there’s a little cart selling spike hot chocolate, spiked coffee and mulled cider. While guests can’t bring in outside food or drink, parents can pack infant formula or milk for kids. Okay, so now that you know what this event entails, let’s talk about tickets. This is probably what you’re looking for. 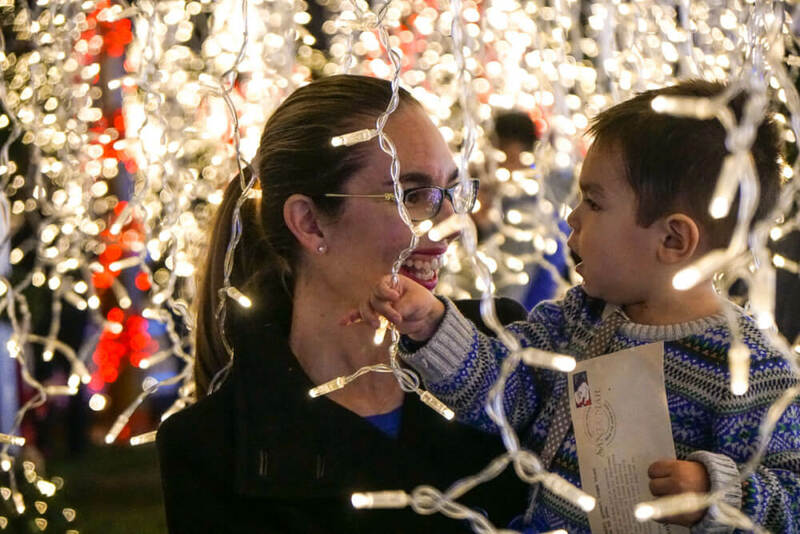 General admission tickets give you full access to the Light Maze, Santa’s Workshop, live entertainment, and the holiday market. Ticket’s start at $19.99 for kids (ages 4-13) and $26.99 for adults (ages 14-64) on select nights. On weekends, it’s $23.99 for kids and $32.99 for adults. You can also get a Family Pack of general tickets (two adult and two child tickets) to save a little money. Family Packs are $79.99 during the week and $89.99 on the weekend. If you want to go all out, Enchant VIP tickets are an option. Enchant VIP tickets start at $64.99 for kids (ages 4-13) and $84.99 for adults (ages 14-64.) 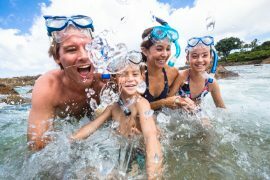 Family VIP passes start at $234.99 and includes 2 adults and 2 kids. If you think you’ll go more than once, you might look into getting a season pass. Enchant Season Passes are $49.99 for kids (ages 4-13) and $69.99 for adults (ages 14-64) and guests can go unlimited times throughout the event. Note: You can only reserve one date at a time and must complete your visit before reserving another date. 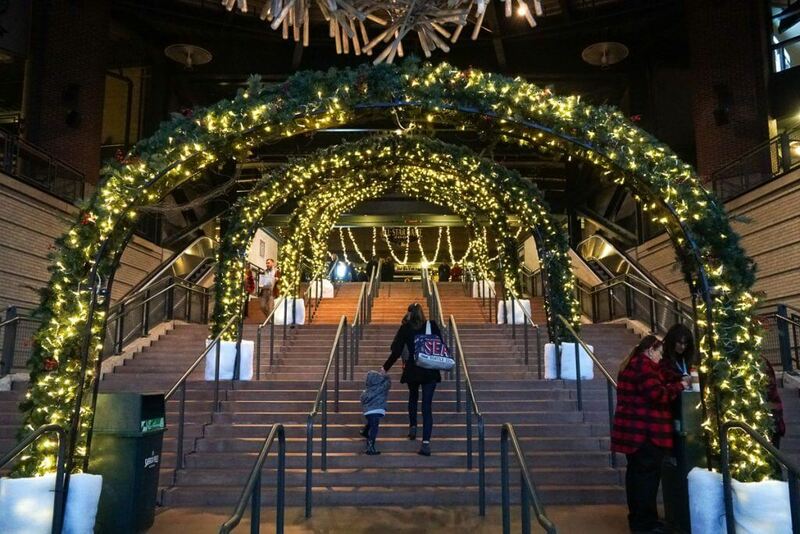 Enchant Christmas: Is This Seattle Christmas Event Worth the Cost? This is the number one question I’ve been getting all week via email, Facebook, text message, and Instagram. And it’s a tough one to answer. 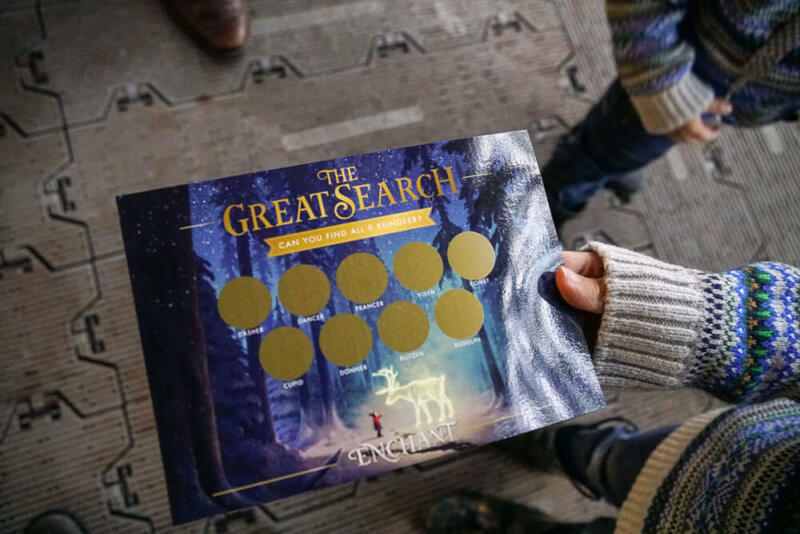 I’d suggest thinking about Enchant as an event to experience with your kids. It’s about the same price as taking them to a concert (or one of those fancy movie theaters) where concessions and merchandise is expensive. 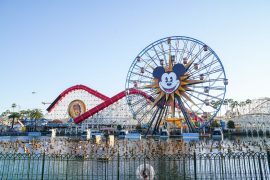 But, unlike taking them to a concert or movie, Enchant is an opportunity to talk and laugh with your kids as you play in this magical playground together. And it’s something you probably haven’t done before. 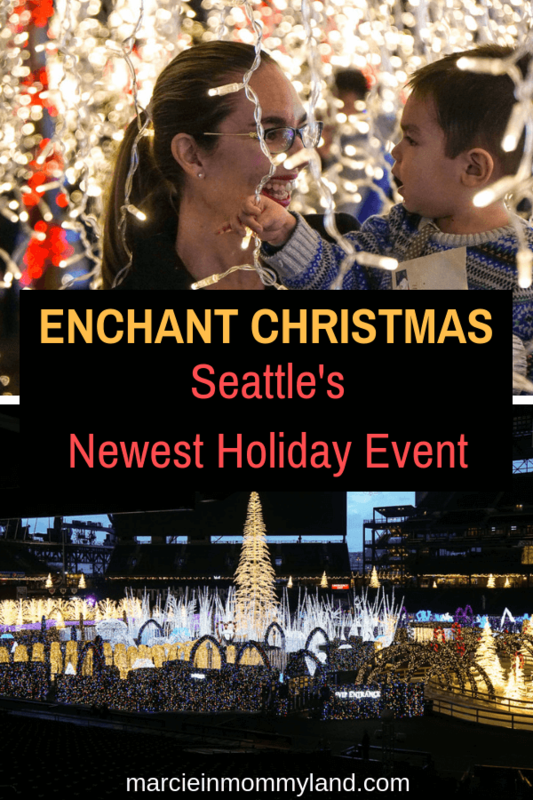 If you are looking for a unique holiday event in Seattle, Enchant Christmas is it! For our family, I received 2 adult tickets as compensation for being an Enchant Ambassador this year. However, I still had to pay for my oldest son and for parking. I’m glad our whole family was able to to because I really think Enchant Christmas is geared for young children. Our boys has a sense of wonder and awe the whole time they were in the Light Maze! I was a bit sticker shocked with the price of the food and drinks (I’m not paying $9 for a slice of pizza.) But, I always balk at food prices at events I’d say it’s on par with the price of stadium food. 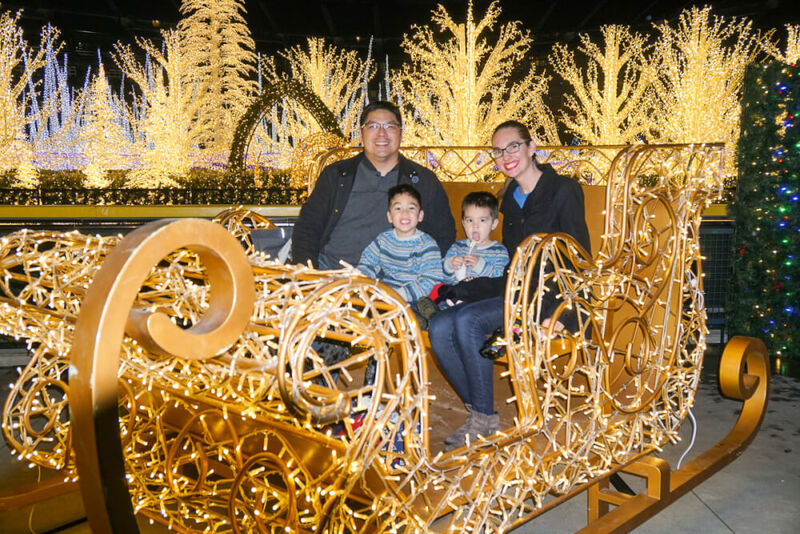 Our family really enjoyed seeing Santa and exploring the Light Maze! Our kids couldn’t stop dancing every time they found a reindeer! And they were so excited to sit in Santa’s sleigh! Yes, it’s a splurge, but it’s an event that may or may not come back to the Seattle-area anytime soon. They have previously done events in Vancouver, BC and Arlington, TX. 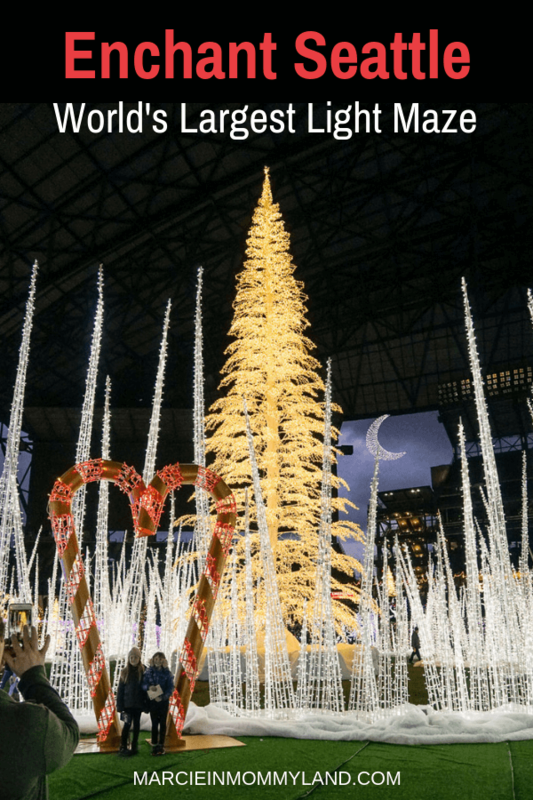 So if you are looking for a new holiday event to do this year, I’d say go for it! 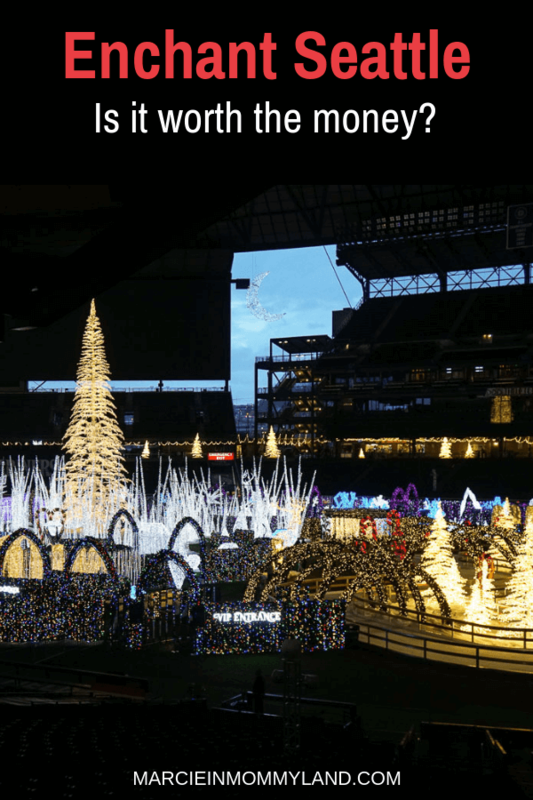 I mean, it’s one of the few opportunities you’ll have to see gorgeous light displays without shivering outside in the cold, damp Seattle weather! Of course, I’m here to share my tips and tricks for maximizing your experience! If at all possible, go on a weekday. The prices are cheaper and it’s less crowded. I’d also suggest going earlier in the month, as I think it will get more crowded the closer we get to Winter Break. We went right when they opened from 4pm-6pm and there was no wait at security. We saw Santa hanging out at the entrance and we were able to say hi and chat with him without anyone else around. There was no line to get into the Light Maze. It didn’t feel crowded and it was easy to get photos without strangers in the background. Parking for Enchant Seattle is located at 301-337 Edgar Martinez Dr S, Seattle, WA 98134 directly across the street from Safeco Field. I recommend ordering your parking pass online. It will save you a bit of money and it guarantees your spot. Once pre-paid parking is sold out, you will need to purchase parking at the event. Even though you are inside Safeco Field, it’s still open on the sides and it’s not warm inside. My husband and I wore coats and our kids wore coats until they were too hot and then just ran around in their holiday sweaters. While I didn’t need a hat or gloves, I might have on a colder night. If you’re planning on taking photos, you might want to wear a Christmas sweater or something that will look cute in photos. I also saw a few girls running around in Frozen costumes (like Elsa, Anna, and Olaf) and I thought that was a brilliant idea! Don’t forget to print your tickets or pull them up on your phone. If you have an issue, talk to the ticketing area and they can help you out. Definitely bring a camera with you so you can take photos in the Light Maze and with Santa. Instead, wear babies and young toddlers in a carrier. We also saw a lot of older toddlers on parents’ shoulders. Parents with babies can bring a diaper bag as well as any medical bags. Parents can bring in infant formula or milk. There is a Nursing Mother’s Lounge near the Guest Service Center. There are also tables and chairs around the concourse. 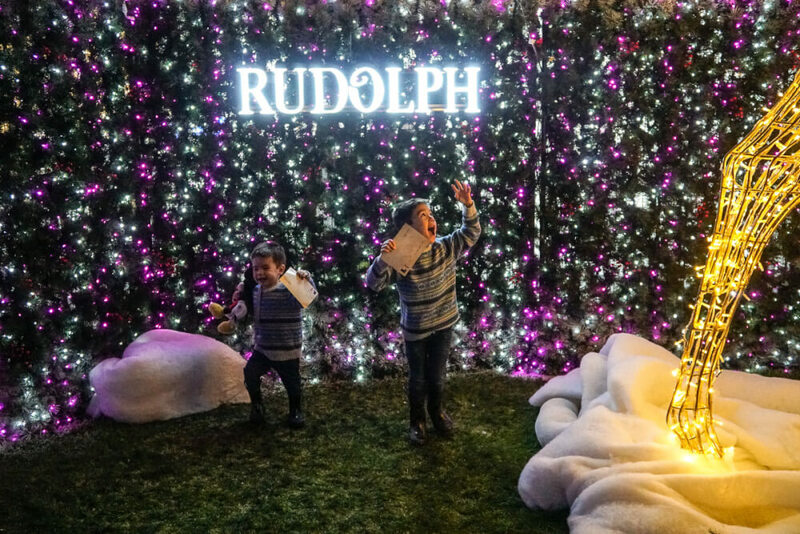 Chances are, you will be wanting to stop and take photos of your kids at the wonderful photo ops set up all over the Light Maze. However, your kids will be on the hunt for Santa’s reindeer and your photo taking will just get in the way. So, I recommend letting your kids search for the reindeer first and then encourage them to pose for photos before picking up their candy cane on the way out! Enchant Christmas provided 2 press tickets. All opinions are my own.